Put down that Hershey’s Krackel bar, and step away from the Nestle Crunch bar. Here’s a recipe for Chocolate Crunch Squares that will make you forget that those candy bars ever existed. 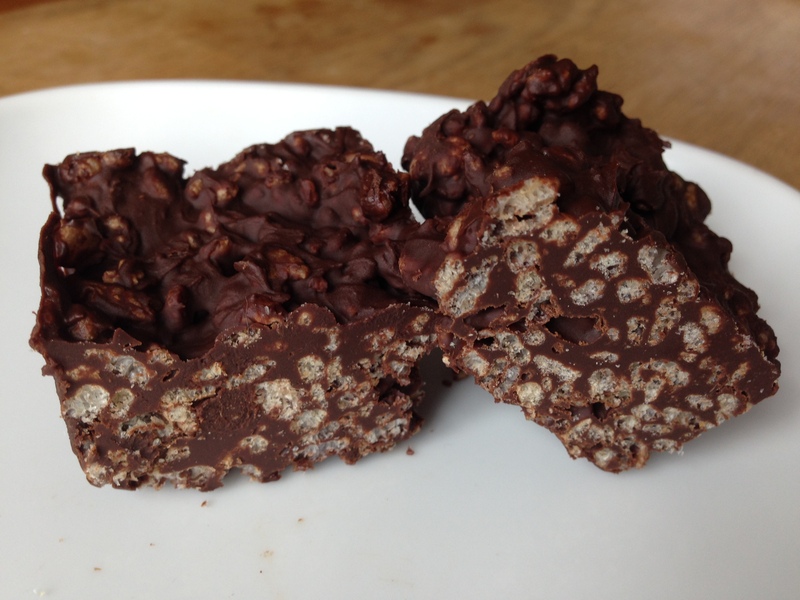 The combination of dark chocolate and puffed rice cereal with a touch of almond butter and honey makes this one of my favorite candy bar knockoffs (although they look more like rice krispie squares than thin candy bars). I like to eat mine slightly chilled for that extra crunch. On top of a double boiler, melt the chocolate and butter. Add the almond butter and honey, and mix until combined. Remove from heat, mix in the puffed rice cereal, and pour into a 9-inch square baking pan. Let set in the refrigerator, at least 2 hours. Bring to room temperature before cutting. I prefer these bars slightly cold, and I stored them in the refrigerator to keep the chocolate from melting in the warm weather. 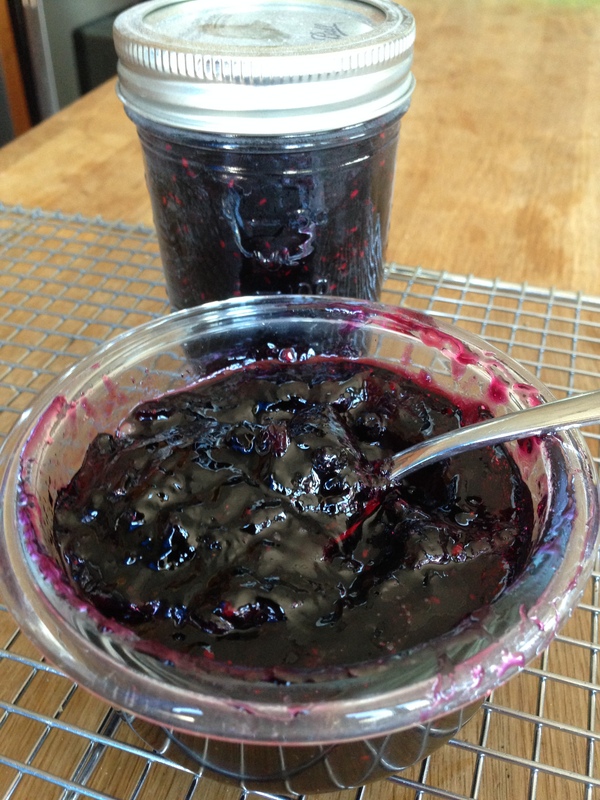 My freezer was in dire need of cleaning out, so I made good use of several bags of frozen blueberries and raspberries that had been lingering in the back of the freezer and made a mixed berry jam with orange zest. The cook time for this jam is much shorter than that required for the usual strawberry jam that I make (due to the use of pectin), and jam is is super sweet, so I’ll be using it sparingly and pairing it with foods that aren’t too sweet to begin with. The flavors are bright and fresh, and the orange zest adds a nice little zing to the wild blueberries and raspberries. Prep jars for canning. Rehydrate the orange peel (if using) in the lemon juice. Defrost the frozen berries. I ran mine under warm water very briefly to get rid of the frost. In a large saucepan over high heat, stir together the berries, sugar, lemon juice, and orange peel. Bring to a full rolling boil while stirring constantly. Once the mixture has reached a boil, stir in the pectin. Boil for one minute, stirring constantly. Remove from heat; skim off foam. Ladle the hot mixture into hot sterilized half-pint jars, leaving 1/4 inch headspace. Remove air bubbles; wipe rims and adjust lids. Process for 5 minutes in boiling water. It’s been oppressively hot and humid in LA recently, and I thought you might want to look at some sweets that remind you of cooler, airy-er times. These meringues are delicate, crispy, and light as a cloud. They’re only slightly sweet, and the milk chocolate square in the center adds a touch of rich, creamy contrast. Note, I did not make these during the hot humid weather as they don’t set up well in humidity. Preheat the oven to 200°F. Line a baking sheet with parchment. In a large bowl, combine the egg whites, cream of tartar, and a dash of salt. Beat until peaks form, then gradually add the sugar, continuing to beat until the mixture is stiff and glossy. Pipe a base of meringue onto the sheet, using a pastry bag and star tip; place a candied cherry, or a couple of chunks of chocolate, atop the base. 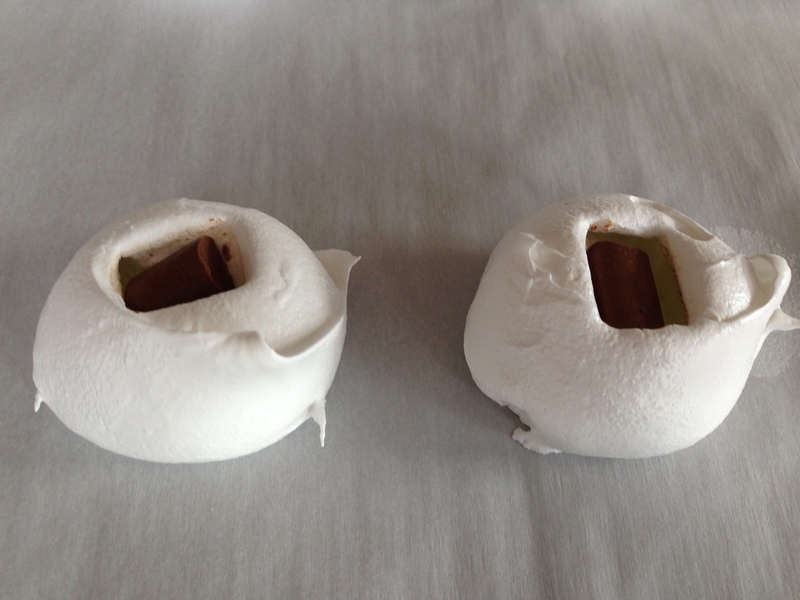 Pipe meringue to cover the cherry or chocolate. If you don’t want to pipe meringues, simply drop by tablespoonfuls onto the sheet. A tablespoon cookie scoop works well here. Place cherry or chocolate in the center of each meringue; cover or leave exposed, your choice. Bake the meringues for 1 1/2 hours. Turn the oven off, and leave them in the turned-off oven until they’re completely cool, 3 hours or more. This is a good cookie to make in the evening; they can be left in the oven (with the heat turned off) overnight. Put potatoes, shallots, carrots, parsnips, and garlic in large heavy roasting pan, sprinkle with smoked paprika, and toss with 3 tablespoons of olive oil to coat. Season with salt and pepper. Spread vegetables evenly over bottom of pan. Place 2 rosemary sprigs on top. Finely chop enough of remaining 2 rosemary sprigs to equal 2 teaspoons. In small bowl, combine 1 tablespoon salt and chopped rosemary. Rub mixture together with your fingertips for about 1 minute, or until fragrant. Using sharp knife, score fat that covers top of pork by cutting shallow slashes (about ¼ inch deep) at 1-inch intervals, cutting into fat but not flesh. Rub pork all over with remaining 1 tablespoon olive oil. Rub rosemary salt all over pork, working it into score marks, if desired, tie pork crosswise with kitchen twine in three or four places to help maintain its shape while roasting. Place pork fat side up on top of bed of vegetables. Roast for about 40 minutes, or until pork is golden brown and an instant-read thermometer inserted into center reads 125°F. Transfer pork to serving platter. Tent with aluminum foil and let rest for 10 minutes before slicing (pork will continue to cook as it rests). Meanwhile, stir vegetables in pan and continue roasting them for about 10 minutes, or until tender and golden brown. Transfer vegetables to the platter with pork. Add broth to hot roasting pan and bring to boil over medium-high heat, stirring with wooden spoon to scrape up browned bits in bottom of pan. Season with salt and pepper. Pour pan juices into sauceboat. Untie pork if necessary. 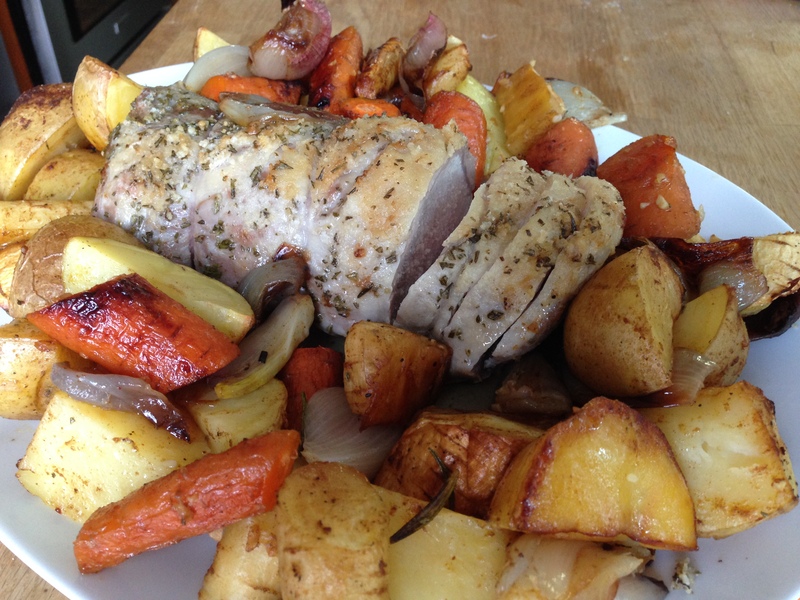 Slice pork and serve it with roasted vegetables and pan juices. Yep, you read that correctly, these biscuits are made with 7-Up soda. But don’t let that scare you off. These biscuits aren’t very pretty, and in its unbaked state the dough was a bit soft and sloppy and barely filled the pan, but whatever the biscuits lack in looks is made up in their perfect texture and flavor. 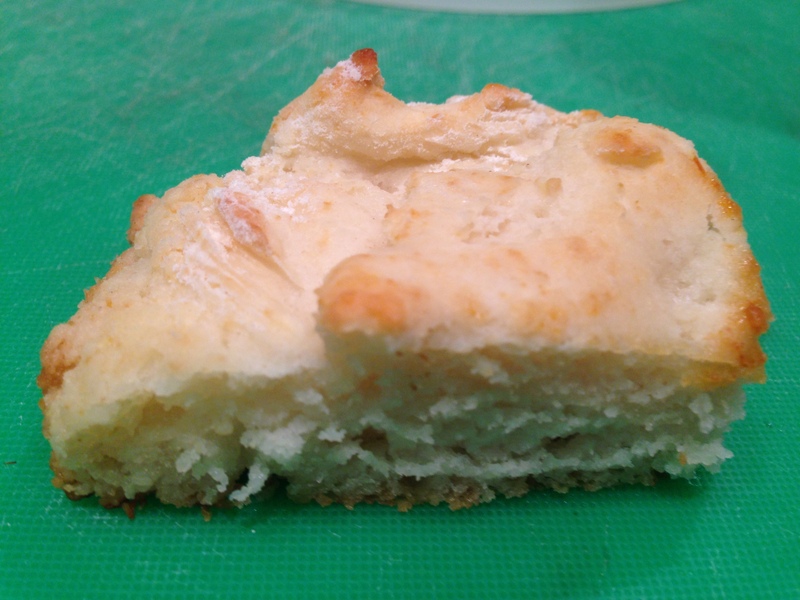 They achieve biscuit nirvana of being sturdy yet light, tender, and slightly spongey and are really flavorful (thanks to the butter and 7-Up) and tangy with just the right amount of salt. Plus, they’re quick to make as you just pat the dough into the pan and bake (no need to roll out the dough and cut out the biscuits). In a large bowl, combine the Bisquick and salt. Add the sour cream to the dry ingredients, and stir until the mixture is lumpy and moistened. Slowly pour in the 7-Up. I didn’t use the full 1/2 cup, because it would have made my dough too wet and too sticky to pat out. Sprinkle about 1/4 cup of flour on a wooden surface, and pat your dough into a 9×9 inch square. You do not have to knead your dough. Put a little more than half of your melted butter in the bottom of the 9×9 inch baking pan, and swirl it around to fully cover the bottom of the pan. Place the dough over the butter in the pan. Brush the remaining melted butter on top of the dough. Bake for 10-15 minutes until the top is golden brown and a cake tester comes out clean. Do not overbake as the biscuits will dry out. Gummi vitamins are not the only way to get your daily servings of fruit. 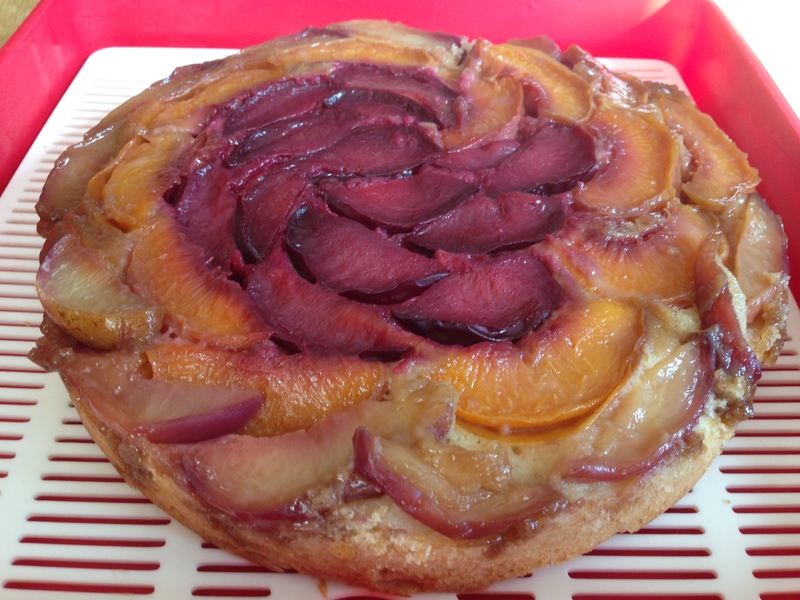 I present to you another option with this Fruit Upside-Down Cake. 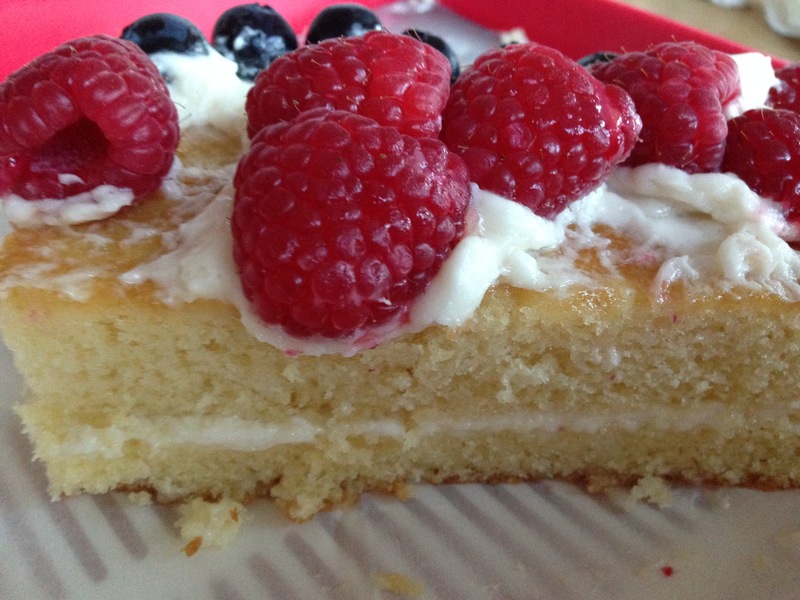 So, the nutritional content may be more cake than actual fruit, but who’s complaining? You can make this cake with a variety of fruit (fresh or frozen). I used yellow peaches, white nectarines, and plums. The great thing about this cake is that you can be creative with your fruit combinations and make the cake look as rustic or fancy as you’d like, and it will always taste good. If you are using fresh fruit, be sure it is washed and dried. Slice it into wedges or dice it into large 1″ chunks. Most berries can be left whole and smaller stone fruit such as cherries and apricots can be halved. If using frozen fruit, do not defrost. To make the brown sugar glaze, place your 9-inch cake pan on a burner over low heat and add the butter. Once the butter has melted, add the brown sugar and stir it gently. When the brown sugar has melted, turn off the heat, but leave the pan on the stove. To make the cake batter, in the stand mixer, cream the butter and sugar until fluffy. Add the eggs one at a time to the butter-sugar mixture, beating well in between. Add the vanilla to the wet ingredients. Add the flour mixture to the wet ingredients, and beat on low-speed until just combined, about one minute. Arrange the fruit in the baking pan, being sure to crowd the pan as much as possible. The fruit will shrink a little when baked. I created an overlapping spiral pattern with my fruit. Dollop cake batter over the fruit, making sure it is evenly distributed. Smooth with a spatula. Put the cake pan on a baking sheet (in case the fruit bubbles up and overflows) in the oven. Bake for 30 to 40 minutes, or until the top of the cake is golden brown and a thin knife or toothpick inserted in the center comes out clean. Remove the cake from the baking sheet and place it on a cooling rack. Let the cake settle for a minute, until any fruit that has leaked up the sides has stopped bubbling. Do not let the cake cool or you will not be able to get it out of the pan. Run a knife around the edges of the cake. Place your cake plate over the cake and, using hot pads, carefully flip the cake over. Gently remove the cake pan. Be careful, as the fruit and glaze is still quite hot and will burn. Re-arrange the fruit and let the cake cool. If any pieces of fruit are stuck to the cake pan, gently scrape them up with a knife and replace them on the cake. Let the cake cool. Serve the cake at room temperature or sightly warm. To store, wrap carefully in plastic wrap or store in an airtight container. This is a story of of an incredibly forgiving and flexible recipe that helped avert a baking disaster. It’s a story about using less than ideal ingredients, cutting corners, ignoring instructions, being in denial, pushing forward even with barely a glimmer of hope, and emerging victorious with a fantastically delicious cookie. These are all the ways that I deviated from the recipe and nearly ended up with a baking disaster. I didn’t have enough almonds so I used almond flour (from Trader Joes) and pecan pieces, about half of each. My cream of tartar was old (and apparently ineffective). I used egg whites from 4 large eggs, but I did not measure to see if they actually equaled 1/2 cup, and I didn’t bother waiting for them to reach room temperature. I barely achieved soft peaks when whipping my egg whites, and I didn’t get anywhere near stiff peaks, thus ending up with a severely runny meringue. However, I did make a few good decisions that likely made a big difference in the outcome. I used Nielsen Massey almond extract. I lined my cookie sheets with parchment paper. I allowed for ample space between the cookies because they spread a lot during baking. I let the dough sit on the cookie sheets for 40 minutes before baking. And ultimately I did not throw away the batter before doing a test bake (even though I was really tempted to do so). The results were more fantastic than I could have ever imagined. 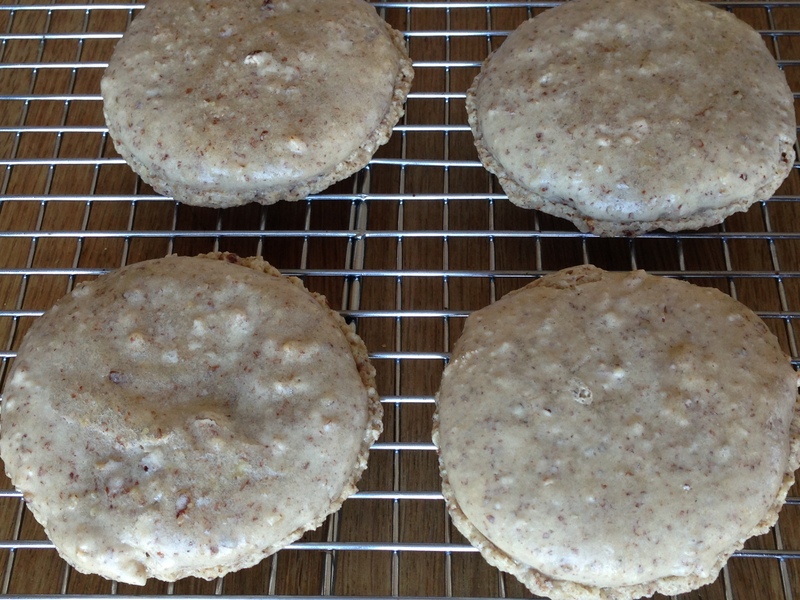 While my nut meringue cookies didn’t look anything like the high piled cookies in the cookbook, they did look a lot like big thin macarons. They turned out to have the most divine texture with a light, crispy top and chewy center. The almond extract really shone through packing a lot of flavor in a deceivingly light cookie. Position the racks in the upper and lower thirds of the oven and preheat the oven to 300°F. Line the cookie sheets with parchment paper. Combine the almonds, powdered sugar, and salt in the food processor and pulse until the nuts are finely ground, scraping the sides as necessary. Using the electric mixer, beat the egg whites with the cream of tartar in a large clean, dry bowl at medium speed until the egg whites are creamy and white and soft peaks are formed when the beaters are lifted. Gradually add the granulated sugar, beating until the whites are fluffy and very stiff. Pour the almond mixture over the meringue and fold in with a large rubber spatula just until fully incorporated. Bake for 30 to 35 minutes, until the cookies are golden; rotate the sheets from top to bottom and from front to back halfway through the baking time to ensure even baking. Set the pans on racks to cool completely, or slide the parchment liners from the pans onto racks. The cookies keep in an airtight container for weeks. Here’s proof that everything that comes out of my kitchen isn’t always chocolate. 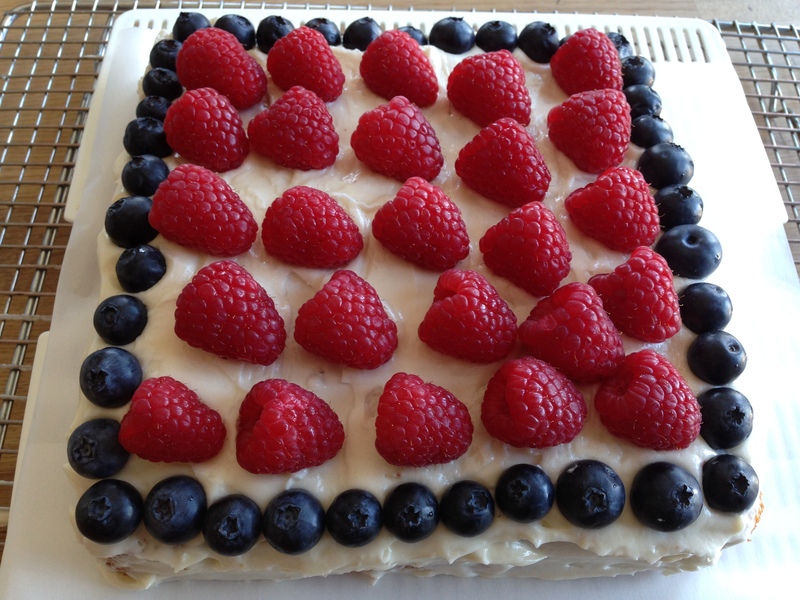 I made this cake a few weeks ago for a birthday, but it seems to also be fitting for a 4th of July celebration. This Berry Vanilla Cake is made up of vanilla buttercream frosting nestled between two layers of tender vanilla cake, and the top layer of cake is slathered with more frosting and topped with berries. The frosting is unique (to me) in that it’s the first frosting I’ve made that doesn’t use powdered sugar, and the cream and sugar are heated on the stove top until boiling. It takes much more time (compared to the usual mix milk with powdered sugar version) to make this frosting, but the texture is so delicate, light, and creamy and the flavor is so rich yet not overpowering that it will be hard to go back to the my “old” version of frosting. I opted for berries because I’m not very good at piping and other fancy cake decorating techniques. Here’s a close up of the last slice of cake after it had been jostled around and been out in warm weather for a few hours. The frosting started to melt a bit, but I can assure you that everything was still really delicious. Position a rack in the lower third of the oven, and preheat the oven to 350F. Grease and flour the sides of the cake pan and line the bottom with parchment paper. Add the sugar, flour, salt, and baking powder to the food processor and pulse to blend the ingredients thoroughly. Add the cream and butter and pulse quickly, 8 to 10 times, until the ingredients are blended. Add the eggs and vanilla and pulse 5 to 6 times. Scrape the sides of the bowl and pulse 5 to 6 more times, just until the ingredients are blended and smooth. Do not overmix. Scrape the batter into the pan and spread it evenly. Bake for 30 to 35 minutes, until a toothpick inserted in the center of the cake comes out clean. Set the pan on a rack to cool for about 10 minutes. Slide a thin knife or a small metal spatula around the edges of the cake to detach it from the pan. Invert the cake onto the rack and peel off the parchment liner. Turn the cake right side up on the rack to cool completely. Once cooled, the cake keeps, wrapped airtight, at room temperature for 3 days, or in the freezer for up 3 months; bring to room temperature before serving. Thoroughly mix the cream, sugar, and salt (if using) in a small saucepan. Wipe the sides of the pan clean with a silicone spatula and rinse the spatula (any sugar crystals clinging to it might crystallize the frosting when you use it later). Cover the pan, set over medium heat, and heat until the mixture is bubbling all over. Uncover the pan, adjust the heat so that the mixture boils actively but not furiously, and cook without stirring for 1 minute. Use the spatula to scrape the hot mixture into a medium stainless steel bowl. Let cool without stirring, until barely lukewarm, about 45 minutes. Set the bowl in a larger bowl of cold water and ice cubes and add the vanilla to the frosting. With an electric mixer, gradually beat in the chunks of butter and continue to beat until the frosting is smooth and fluffy. If it is not thick or stiff enough, keep it in the ice water and continue to beat until it thickens, or chill the bowl for 15 minutes in the fridge and beat it again. If the frosting is too stiff or cold, set the bowl in a larger bowl of hot water until the frosting starts to melt around the bottom, then beat it or stir briskly with a spatula until it reaches the desired consistency. Cut the cake in half so that you have two layers. Flip the top layer, cut side up, next to the bottom layer. Spread about 2/3 of the frosting over the bottom layer of the cake. Set the top layer, cut side down, on the frosting, and frost the top and sides of the cake with the remaining frosting. Add berries or any other type of decorations. The original recipe says that the cake keeps in an airtight container at room temperature for 3 to 4 days, but I refrigerated my cake overnight and ate it the next day after bringing it to room temperature.